Getting my kids to brush their teeth, and to brush well, has always been a challenge! Even now that my kids are in elementary school, I still have to make sure they brush daily and do a good job of it. I remember when my kids were younger, and we had to find toothpastes and toothbrushes that they liked. It was a neverending cycle of trying to find the right combination, from a character toothbrush to a flavor (or cute bottle!) of toothpaste they found appealing. Then came the tactics – like chore charts and bedtime checklists – to try to get the kids into a routine. Another one of my strategies was (and, admittedly, still is) to have several toothbrushing stations. So, there are toothbrushes, toothpastes, and rinse cups in all of our bathrooms. Because, you know, when the kids go downstairs for breakfast in the morning, it is a really long way upstairs to brush! Now that the kids are older, it can still be a challenge to make sure they do a good job. I am fortunate that we found the Hello line of toothpastes, because that is one less battle. The kids love these toothpastes, so there is no reason to put up an argument about that! The great thing about Hello is that I don’t have to compromise on things like ingredients. I’m pretty sure I even bought toothpaste with glitter in it once, so fortunately, those days are behind us. Hello toothpaste tubes are BPA free, for starters. And as a label reader, most toothpastes scare me, but not these. I have always tried to stay away from things like triclosan, microbeads, dyes, artificial sweeteners, preservatives – so why would I give those to my kids? 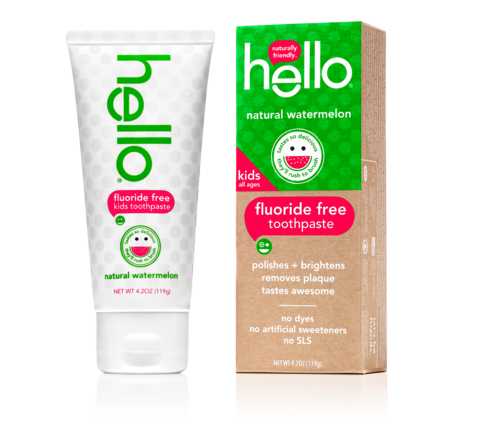 The kids love their Hello toothpastes, which include Blue Raspberry, Watermelon, and Bubblegum. So although my bribery tactics are no longer needed, I do still have a toothbrushing station in each bathroom. Which can mean two tubes of toothpastes at each station, one for each child. At least I know they are brushing their teeth! Now, our biggest issues seem to be if one child uses another’s toothpaste. Both kids are very protective of their Hello Toothpaste, and so they don’t like to share!